From left, USU scientists Abby Benninghoff, Tatiana Soboleva, Marina Popova and Lisa Berreau are developing molecules to deliver controlled amounts of carbon monoxide to targets within the human body. The team recently published two journal articles. Scientists at Utah State University are exploring the controlled release of carbon monoxide for therapeutic applications and the team is earning international attention for their findings. USU chemist Dr. Lisa Berreau said carbon monoxide, or CO, is produced in our bodies; it is produced at the site of wounds. 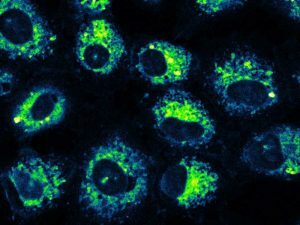 A microscopic image of human lung cancer cells, in which the USU-developed molecule carrying carbon monoxide is shown to target mitochondria, as revealed by the bright yellow-green color. So CO has potential in creating advanced blood flow. It also could be used with an area of tissue that you want to eradicate, such as a tumor. She said the USU team is developing its’ carbon monoxide-releasing molecules from flavonoids, which give the bright colors to certain fruits.